Rockreation offers three levels of participation for our Rockwarriors members at both of our locations: Club, Advanced and Elite. 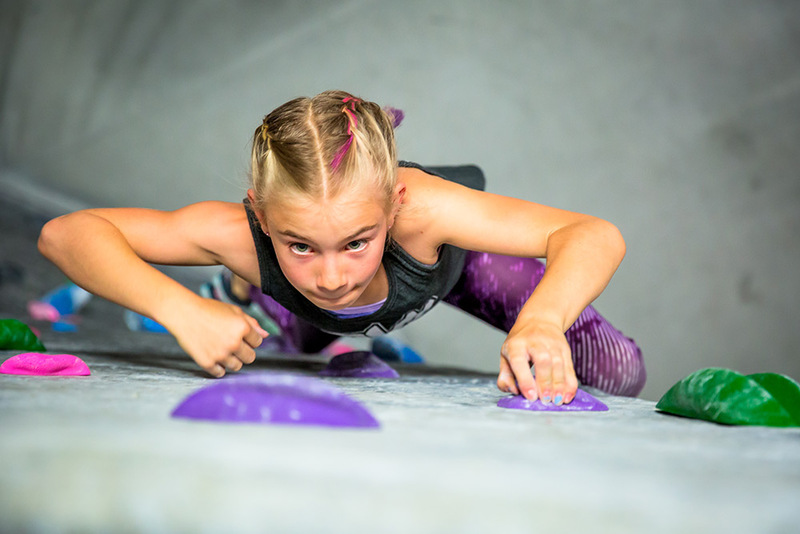 This way youth climbers can start small and work their way up to competitive environments and more advanced training with their peers and those with previous experience can try out for whatever level suits them best. See full descriptions, requirements and contact info below. The Rock Warriors club team is for intermediate through advanced climbers who desire regular climbing practice not focused on competition climbing. Practices are more relaxed, but still emphasize technique development and overall fitness. The Rockwarriors Advanced Team is for kids ready to make the mental and physical transition from “climbers” to “athletes-in-training”. The Advanced Team will introduce climbers to competition climbing, climbing specific training, further technique development, and goal setting. An emphasis on strength and flexibility are core components of the advanced team. Climbing specific cross training is provided by Rockreation trainer, Sergei Marasanov. Techniques on mental preparation, teamwork and leadership skills are also introduced on the Advanced Team. *Season fees cover coaching fees for competitions, travel and additional expenses throughout the season and allow access to FIVETEN’s shoe pro deal program for all RW’s. All Rock Warrior team members pay season fees as part of a team to help support coaches and staff for competitions. Advanced athletes have a lot of fun in a supportive environment, but they take their climbing more seriously. All members of the advanced team must attend two practices a week and have all their own gear. Advanced team kids must attend at least one local competition per season however are encouraged to compete for the entire local season. To compete at the local level and at Regional Championships climbers must compete in two local competitions. Local competitions are held at various gyms in the SoCal region. This requires the climber to travel and parents must be willing to facilitate that. Advanced team members will be invited to compete at Regionals based on their performance and commitment during the local season. * Prerequisite: Must attend try-outs or receive approval of the head coach to join. Ability to attend at least 2 practices per week. The Rockwarriors Elite Team has the highest requirements in terms of : commitment to training, practice hours and attendance at competitions. Rockwarrior coaches structure practices around training and conditioning for USAC competitions, preparing the climbers for local, regional, divisional and national events. Climbing specific cross training is lead by Rockreation trainer, Sergei Marasanov and focuses on strength, flexibility and mobility required of the athlete. In addition, Elite team members will also work on mental preparation, nutrition and time management with coaches to help them best prepare for the season. Ability to attend at least 3 practices per week. Questions? Contact Head Coach, Steve! Sign Up for TRY OUTS!